The ultimate multichat solution for Minecraft servers. This project is terminated due to terrible code. The next generation is releasing soon, leaded by Bernard2521. However, it is premium. We are planning to make a lightweight version which is free. Also, all Minecord coming soon features are implemented in the next generation. It also has much more features than Minecord. More features may be added soon. The library com.rcextract.commons along with the Serialization API 2.0 (com.rcextract.commons.io) as a standalone resource. It is time to ditch traditional Mailbox systems and vanilla chat system*. A brand new advanced MultiChat system is here to enhance your server very much. Your players can chat secretly without being heard by other strangers. Use the API included to build team, faction chats. Possibilities are endless, the only thing you need is learn to use and expand Minecord. Click here for wiki. *It is impossible to remove the vanilla chat system. Minecord simpily wraps it so you won't feel the vanilla chat system existance. Ranged chats, party chats, team chats, faction chats, private messanger, admin chat, etc. They all have the same feature that limits a message visibility to only a few players, and this is what Minecord presents. Convert your ranged chat into a few lines of code now. Also, Minecord helps you to save what you need automatically to the database*. *Only objects inherit any class in Minecord API can be saved. Visit wiki for more information on how to do it. *Server does not mean Minecraft server. Instead, it is a grouping of channels which are related to a topic, team, faction, etc. This plugin requires database to store data. It is tested that MySQL works completely fine, so MySQL database system is recommended, download available from here. Make sure you provide correct information, including the database host, username and password in the configuration. Incorrect information will cause the plugin to fail from loading data from the database. 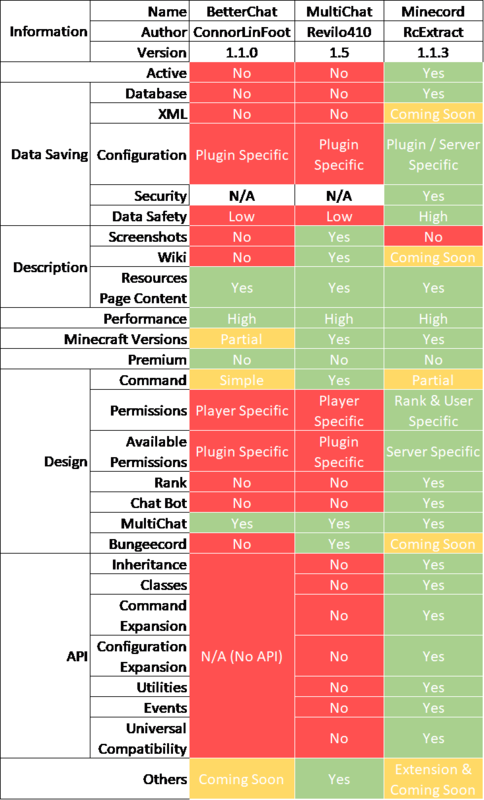 More information about configuring Minecord properties will be mentioned below. It is discouraged to modify data from the database currently, until a tutorial on how to manage the data from the database is posted. Minecord will automatically generate databases and tables needed, so you don't need to initialize the database for Minecord yourself. Starting from Minecord Update 1.1.3, Host, user and password no longer stores inside the configuration file due to security reasons. To configure it, please visit Commands section. # A simple configuration file for storing what format should chat messages be sent in. Format. Minecord determines how messages sent by users should be formatted by this something like regular expressions, which then Minecord will replace the placeholders with the current value when a message is sent. Auto-save. This field configures how frequent should Minecord automatically save data when enabled, in seconds. To disable auto saving, put an integer 0 or below. You are warned that you should modify this with special care to how much RAM is allocated for your server, because setting the value too low will cause serious lag. Recommended values are above 180. 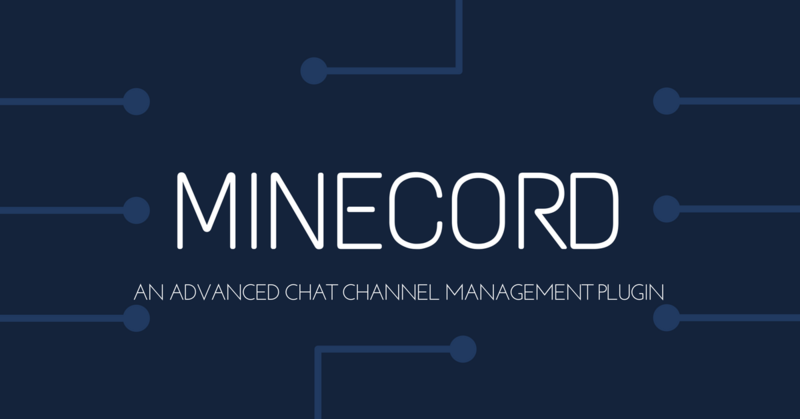 /minecord connect host user password: Modifies the preferences for connecting to the database. If the command execution is not the first time on the JRE*, connection will be automatically attempted to be opened. /minecord status: Check whether Minecord is ready for using. It is usually not ready when an error occurs while connecting to the database, or before setting host, user and password the first time. If you encounter any issues, please open an issue ticket at here. Suggestions and reviews are the only read messages in the discussion. Roy7885 and LukasTGDE like this. I think the plugin is nice, but... is there a video or screenshots on how to use it? Instead of providing screenshots, though i may do it in the future, i am creating a wiki for showing how to use Minecord. I will open it to public as soon as possible! Advanced AntiCurse, Fast Messaging, Private Messenger, etc.